Tuning around the SW bands this morning and stumbled across a S9+25 signal at ~13560 kHz (13560.3 kHz). Never have seen it before this morning (~1830 UTC). For a few months, have had something that sounds like ethernet over powerline. That QRM sounds sorta like ignition noise in the 13 MHz and up, with the amateur bands notched out. Today this big power house of RFI shows up on 13560. Have a Wellbrook loop, so turn it to null it out and its null is seemingly consistent with the direction of the ethernet over powerline. Thought at first might be a grow light, but apparently that RFI is down around 40m. Took a portable radio around the house and the signal varies, but is still very strong. Went outside to the front and it was about the same as inside the house, walked around back and it went up ~30 dB (about 150' from front to back). 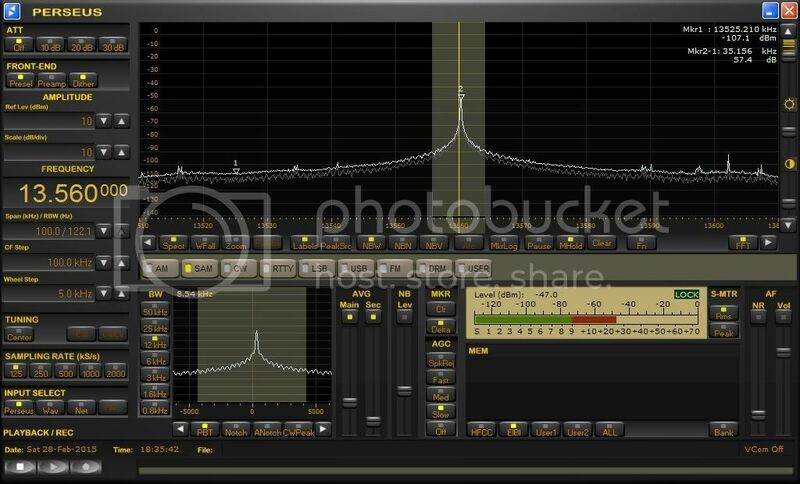 For this measurement, using a GP-5/SSB with the built-in whip. Didn't go around the other side of the neighbor's house yet, probably do that tomorrow. From watching the waterfall, its definitely nearby and not coming in from afar. Update, 1959Z: Its gone. I don't know what time it left. There is about a ~1 kHz band of noise around 13560, but that is certainly not the mess that was on earlier. Can now see & hear a weak CODAR station (13516 to 13578, or thereabouts). Update, 2229Z: It came back now. Have Perseus monitoring the frequency with the marker log to find out the times of operation. 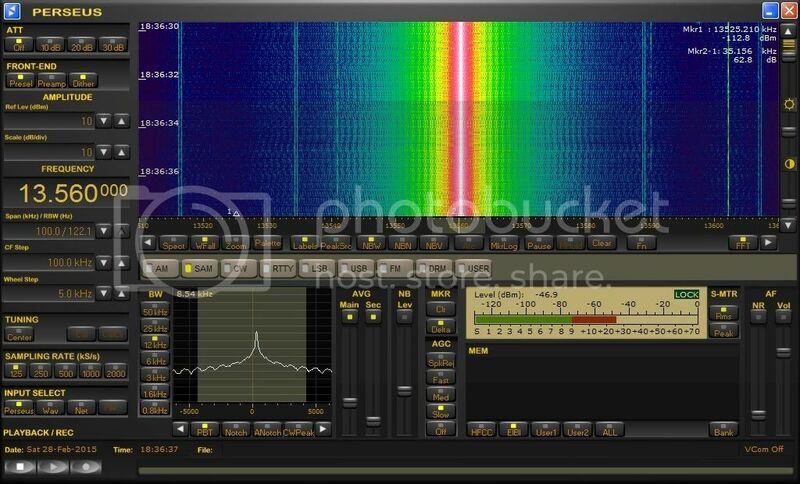 Below are screen shots of the spectrum & the waterfall when the loop is pointed at it. 13560 kHz is an ISM (Industrial, Scientific, and Medical) frequency allocation. It is a frequency range where intentional radiators not meant for communications use can be put. As such it can be very hard to determine what might be heard there. RFID systems, lasers, etc, all can be found there. There is also a fair community of beacon enthusiast around that frequency. I have no ID what this signal posted is, but whatever it is I think you will find it is probably not communications related. Hopefully someone will have an answer.